John Parker is a trial lawyer. He has been called on by clients to try their most pressing and complex disputes, regardless of the area of law. For example, John has tried multimillion-dollar CERCLA liability and cost recovery cases, major supply contract cases, shareholder actions, fraud cases, and post-closing purchase price disputes arising from the sale of a business, among others. John has handled environmental litigation in numerous states, including Michigan, California, Texas, New Jersey and Delaware. He concentrates his litigation counseling practice primarily on environmental matters and contractual disputes, particularly those between manufacturers and their distributors, representatives or customers. John brings a unique perspective to his practice, as his previous role as general counsel for a Fortune 500 company provided him with insight into the pressures faced by in-house counsel. This knowledge enables John to respond more effectively to his clients’ needs. 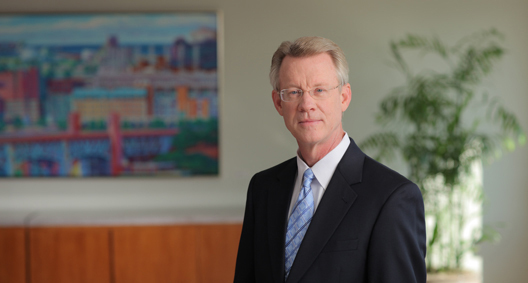 John serves as general counsel for BakerHostetler. He has served on the firm’s Policy Committee and board of directors, and has been the coordinator of the Cleveland office Litigation Group. John has been listed in The Best Lawyers in America© since 2008 and has been ranked in Chambers USA: America’s Leading Lawyers for Business. Tried a multimillion-dollar CERCLA liability case to judgment. Successfully established that the client had no operator liability under CERCLA. Represented a distributor in an action against a manufacturer for breach of a distribution contract. Obtained a jury verdict of approximately $2.8 million. Tried a CERCLA allocation case involving past and future costs potentially exceeding $1 billion. Handled an environmental litigation involving cost allocation between former owners of an industrial property in New Jersey. Serves as lead counsel in a pending federal court cost-recovery litigation related to the cleanup of a former industrial property in Vernon, California. Responsible for an environmental litigation in the Northern District of California brought under CERCLA, the Resource Conservation and Recovery Act and the Polanco Act. Handled a sale dispute arising under the Uniform Commercial Code in arbitration. The client was awarded an amount in excess of $4 million. In an American Arbitration Association arbitration involving a supply contract, obtained an award valued in excess of $160 million for a client. Tried to verdict a suit brought against the former chairman and CEO of a publicly traded company by a major shareholder alleging the CEO made misrepresentations about the company's stock. A jury returned a verdict in favor of the client. Tried an interpleader action for a major bank in a fraud and negligence action, with no finding of liability for the client. Tried a resale price maintenance case in which the plaintiff sought in excess of $100 million. Obtained a directed verdict for the client, which was affirmed on appeal. Provides advice to manufacturing clients on pricing issues and permissible downstream restraints on distributors that do not run afoul of antitrust laws. Served as interim general counsel for a Fortune 500 retail company. Obtained a unique, up-close perspective on issues confronting in-house counsel.